Exceptional Products For Exceptional Yards. Great yards demand equipment that’s as dedicated and hardworking as you. Fortunately, the Husqvarna range of lawn and garden equipment offers everything from lawnmowers and ride-on mowers to trimmers and chainsaws to let you master your great outdoors. You and Husqvarna – together we will make your yard the envy of the neighborhood. The Husqvarna 450 is a powerful all-round saw for people who value professional qualities in a saw. The X-Torq engine means lower fuel consumption and reduced emission levels. Auto return stop switch and visible fuel level makes the saw easier to handle. Equipped with Smart Start and fuel pump to every time ensure easy starts. 2 Year Parts & Labor Warranty. Every unit is tested at the manufacturer. Designed to fit the needs of homeowners and do-it-yourselfers, the 18-inch, 3.2 HP Husqvarna 450 is ideal for landowners and others who cut less regularly. Equipped with Smart Start and fuel pump, it’s easy to start and operate. It also offers an ergonomic design plus built-in Husqvarna features like air injection technology and a powerful X-Torq engine with low emissions. engine life (see larger image). to start (see larger image). The Husqvarna 450 chain saw (see larger image). The 450 delivers 3.2 horsepower, making it well-suited for medium-duty jobs, such as pruning and domestic cutting. 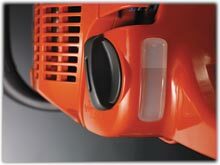 The engine features Husqvarna’s special X-Torq technology, which reduces emission levels by up to 60 percent and fuel consumption by up to 30 percent, so you’ll be able to harness the power of a gas-powered chainsaw without having to worry about heavy pollutant output. The 450’s engine has been built to withstand years of use. It uses a three-piece crankshaft, which has been forged and compressed for superior durability. 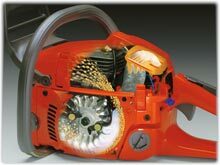 Also, the chainsaw’s centrifugal air cleaning system helps preserve engine life by removing harmful debris before it reaches the filter. With the 450, you won’t have to waste precious minutes trying to start the engine. 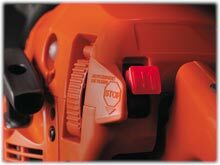 The chainsaw uses a combined choke/stop control, which allows for easy engine starting and reduces the risk of flooding. 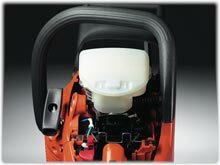 Husqvarna’s Smart Start offers an engine and starter that starts quickly with minimum effort–with resistance in the starter cord reduced by up to 40 percent. It also has a specially optimized fuel pump, which keeps the fuel lines clear and helps facilitate startup. Visible fuel level (see larger image). Quick-release air filter (see larger image). The 450 has a lightweight frame that minimizes strain on your body, even after extended use. Husqvarna’s LowVib anti-vibration dampeners effectively absorb vibration, sparing your arms and hands from added fatigue and allowing you to work longer and more comfortably. And it features a smartly designed rear handle with soft inlay, ergonomic trigger, and asymmetrical handle. The 450 is designed both for fast action when cutting and when you need to modify the chain saw while out in the field. It includes a snap-lock cylinder cover that saves you time when changing the spark plugs or cleaning the unit, quick and easy tool-less chain tensioning and assembling of the bar, and a quick-release air filter for quick replacement. And the transparent fuel indicator makes it easy to check fuel level. Other features include an inertia activated chain brake that helps reduce the likelihood of injury due to kickback, distinct marks for better felling precision, and an air purge function that removes air from the carburetor and fuel system for easier starting. It’s backed by a 2-year limited warranty.